That is all from us for tonight. Be sure to join us tomorrow for more Premier League action, including Tottenham's attempts to go top at West Ham, Newcastle looking to claw their way out of the relegation zone at Stoke and a repeat of the League Cup final at Anfield between Liverpool and Manchester City. Now how can you possibly miss that?! Everton manager Roberto Martinez: “We got a win and that is the only thing that matters. I don’t think we get all this result deserves because before the game people will look at the table and where Aston Villa are. “We always forget that Romelu is only 22, his evolution at Everton has been phenomenal. He is growing all the time, developing his game. He has always been a clinical finisher but everytime he gets into a good position you feel he can score. Chelsea manager Guus Hiddink: "We didn’t want to go into the battle but they forced us. We were sloppy in the first half, starting well with a beautiful goal and I think we could have finished it in the first half. We were complacent in the last pass. They made our life difficult. "We were almost in the relegation zone and had a target to get out of there as soon as possible. We are now winning games in a row and that is encouraging." Bournemouth manager Eddie Howe on striker Josh King - whose partner had a baby this morning: "I was very pleased for Joshua. It's an emotional moment having a child, it can either drain your or inspire you, and I think it inspired him. "I'm not sure how much sleep he's had over the last few days, I think he's been economical with the truth with me as he'd said he'd had plenty of sleep!" Aston Villa Remi Garde: “It is hard when you prepare a plan and so early in game have to change it. The lack of confidence so early reelause 1-0 then 2-0 down. “The positive sign is that we did not give up in the second-half. The reaction was a good sign for the next game. “The Football club is about players ,manager, fans ,board,chairman everybody has to stick together that is the best way to win games. Unfortunately for many reasons at the moment that has not been the case. “As manager and players we have to focus on what we have to do and try to do that. “It is difficult to stay positive when you miss chances like we miss today, it is difficult but seeing our opponents have not taken advantage we are still the same number of points behind them. Earlier this evening, fourth official Kevin Friend collapsed and hit his head on a dugout during the game between Bournemouth and Southampton. Friend, who cut his face in the fall, was treated in the tunnel before being taken to hospital. All the best Kevin. Hope there was no serious damage done. 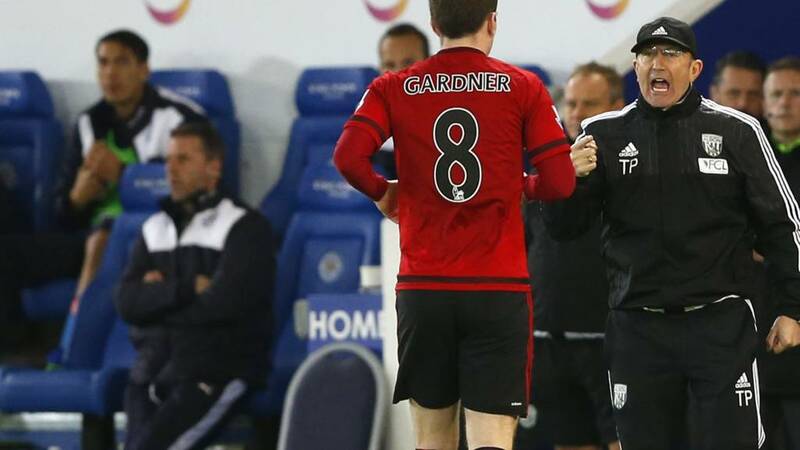 West Brom boss Tony Pulis, speaking to BBC MOTD: “Leicester are a good side. They ask questions of you. It’s another point on the way for us, it’s important for us to get to 40 points and we are happy with the way things are going. We need the hunger and desire to get to 40 points. We should have kept the ball better tonight. I’m really pleased with the players though. Victor Omeiza: if Leicester city wins the league, fine, they deserve it...but just like anyone else that wins it... no sentiments please. David Taylor: Pains me to say this as a Newcastle fan but I think the current bottom 3 will be the three to go down at the end of the season. Emmanuel Ayodele: Sunderland,Norwich, Newcastle, all on 24 point apiece PREMIER LEAGUE IS THE BEST LEAGUE IN THE WORLD. Aston Villa manager Remi Garde: "When you prepare a plan and so early in the game you have to change it, it's very difficult. We were too fragile, we didn't take the advantage of playing at home. "The positive sign is that we never gave up and we reduced the score. But it's difficult to keep a positive mood when you miss chances like we missed today. "The situation is difficult but we have to fight until the end. I try to make sure that everybody still believes it is possible [to escape relegation]." West Brom boss Tony Pulis, speaking to Sky Sports: “A hard earned point without a question of a doubt. They are an old fashioned team in the way they play, they have great enthusiasm and they get crosses in the box. Every fan of this team [Leicester] should be proud of this club as they gave it everything. But we’ve done well, we worked hard. We knew it would be tough, the second game in four days away from home is very tough in the Premier League. To put the effort in we have today is first class. "I can’t wait to see Huthy later, he got banged out of the way and that doesn’t happen very often! Norwich manager Alex Neil: "The first goal is a real disappointment for us. We have six behind the ball and the left back scores. The second is offside and you expect the officials to get that. "The fact is we didn’t really get exposed for the first goal but didn’t deal with it and shut down quick enough. "I felt when it was 2-1 we looked the team controlling and having the pressure. All you can ask is for them to give everything and they did that. They worked very hard in the last few matches and we deserved more but we cant keep having the same story after games. When we get chances we need to take more of them." Everton manager Roberto Martinez: "We managed the game well – it’s always difficult when you’re away from home to get a real good composure but we had that. It’s a performance that won’t get the credit it deserves - Aston Villa had a lot of fight. "I feel that the squad is in a very good moment – we’ve been very consistent the last six games. We’re enjoying our football and playing with a lot of confidence. "Romelu Lukaku is still a very young man but he takes information and responsibility and he’s a real joy to work with. It’s important he keeps that mentality because at 22 he has the world at his feet." In his last two games, Connor Wickham has had seven attempts at goal and scored with four of them. That is a conversion rate of 57%. Looks like Palace do have a goalscoring striker after all. Leicester boss Claudio Ranieri, speaking to Sky Sports: “I am very very pleased. We played so well. We must be calm after they scored and move the ball quickly and made a lot of chances. I am more happy now than against Norwich when we won. We were much better tonight. We know West Brom, they had a very good match and they are dangerous on counter-attacks and set plays. Southampton boss Ronald Koeman: "I'm very disappointed. They deserved more to win than we did because we had problems from the start. "They were more aggressive. If you start like that it is difficult to change. "We had problems because they did a good thing with left full-back as he played very forward. After that (tactical change) we had a little bit more control but we didn't create enough. "We need to be sharper in defending set pieces. They were more hungry than us." Bournemouth manager Eddie Howe: "I'm very pleased for everyone. We knew how big a game it was. It is a long time since we have beaten Southampton. "We were on the front foot from the off. In previous games we haven't got the goals when we have been dominant. "The whole team functioned and when we play well we are a difficult team to beat."